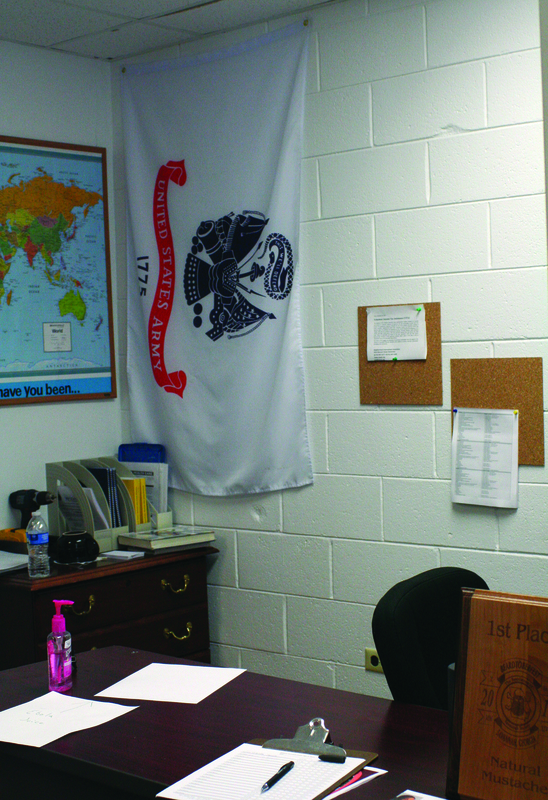 The Military Outreach Center (MOC) at Armstrong opened in 2012 and continues to offer a number of resources for military-affiliated students. At this time, the university has over 800 students with some type of military affiliation, whether they are active duty, a member of Armstrong’s ROTC program, a veteran, or part of a military family. James O’Connor works at the MOC and mentioned a number of conveniences offered inside the MOC, like computer usage and free printing. The MOC also provides a resource library and free tutoring services for military-affiliated students in both English and Math. The MOC not only offers academic aid, but also serves as a place for students to hangout in between classes or during their downtime. It includes a kitchenette and lounge, where students can enjoy free coffee and play videogames on a PlayStation 3. Veterans Affairs Work Study student, Contrella Gibson, added that the MOC is also part of Armstrong’s Green Zone initiative. The Green Zone initiative is a program designed to help veterans adjust from military to civilian life. This program includes certain locations where veterans can go on Armstrong’s campus to receive guidance from properly trained staff members. The MOC is just one of the locations where veterans can receive this type of counseling. The MOC not only assists veterans and active duty members, but also lends information to those who are thinking about joining the military. Those interested can swing by the MOC to find out the necessary steps on joining or gain some insight on what it takes to be part of the military. Military-affiliated students are invited to check out the MOC located upstairs in Room 214 of the Memorial College Center and take advantage of all the listed benefits. The MOC is open Monday through Friday from 8:00 a.m. to 5:00 p.m. As of now, the MOC has no requirements for entering the space, like showing military identification, etc. For more information about the free tutoring, students can go to the MOC and speak with O’Connor.